In a wider push to increase energy efficiency, 19 states are incorporating health and environmental benefits into the cost effectiveness testing of utility-run efficiency programs. Quantifying these advantages is a step towards increased funding and broader program offerings. ACEEE’s new topic brief profiles these states and the unique ways they are accounting for the diverse benefits of efficiency. States vary in how they calculate these benefits, some of which result from reducing energy use and air pollutants. We look at four types of benefits: avoided cost of compliance with environmental regulations, improved air quality and other benefits to the environment, public health gains, and improved health of program participants. 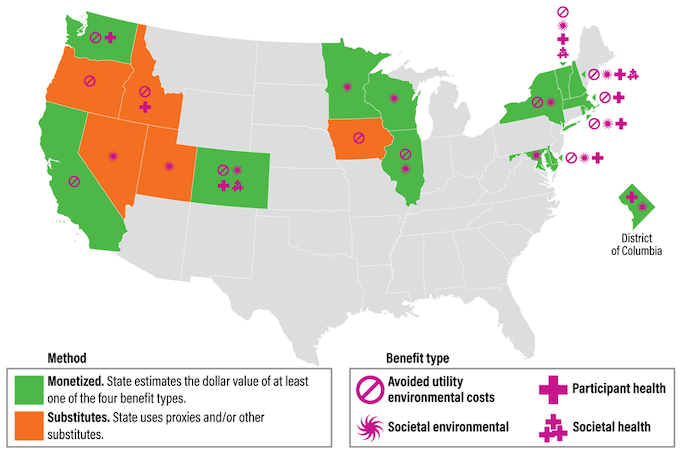 Most of the 19 states monetize the value of at least one of these benefits based on jurisdiction-specific studies or estimates from other utilities or areas. Other states use substitute methods. Many states incorporate these benefits using a traditional cost-effectiveness test such as the Total Resource Cost Test or the Societal Cost Test, as described in the California Standard Practice Manual. Other states have begun using the National Standard Practice Manual (NSPM), which describes a new, policy-focused approach to cost-effectiveness analysis. The NSPM allows states to incorporate their own policy objectives into testing, including efficiency’s health and environmental benefits. While many states account for a variety of these benefits, we recommend several strategies to increase their impact. Take advantage of existing cost-effectiveness tests and develop new ones. Although many of these tests allow for the inclusion of health and environmental benefits, quite a few states aren’t including them. States can more fully account for these benefits by taking advantage of the full potential of existing tests and considering new methods, such as the NSPM. Quantify more of the health benefits. The public health benefits of efficiency are widely unaccounted for, despite the availability of free tools to quantify them. States can map and monetize the benefits of avoided emissions, including reductions in premature deaths, respiratory and cardiac illnesses, hospital admissions, and missed work days. Where monetization is not possible, using substitute methods is preferable to assuming these benefits do not exist. Build on existing resources and conduct further research. Although existing resources provide a framework for quantifying health and environmental benefits, additional research is needed to better account for the variety of benefits across jurisdictions and customer types. ACEEE explored these themes and others at our recent Conference on Health, Environment and Energy. The event brought together experts from the public health, air quality, and energy sectors to discuss the latest research and opportunities for collaboration. Look to the conference webpage for forthcoming links to presentations and other material. Throughout 2019, ACEEE will expand on this research to better understand the methods for quantifying health benefits and opportunities for funding health and energy-linked programs.